Finally, Robin Luciano Beaty is fabulous and the fourth artist in our upcoming exhibition, "Making their Mark in Molten Wax"! 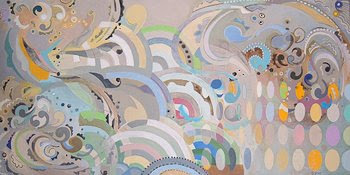 In her own words: "I believe its the artists job to communicate an impression in a voice most have not heard. Traditional landscape painters strive to create a reproduction of place. 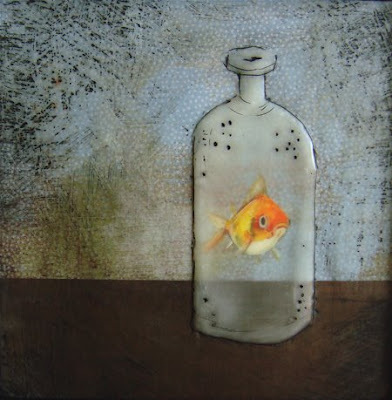 My encaustic paintings derive from my own intuitive perspectives, pulling inspiration from emotion, imagination and memory, concentrating on the often over-looked and unconventional." "My process is driven by the visceral journey of discovering something reminiscent rather than the recording of a specific space. 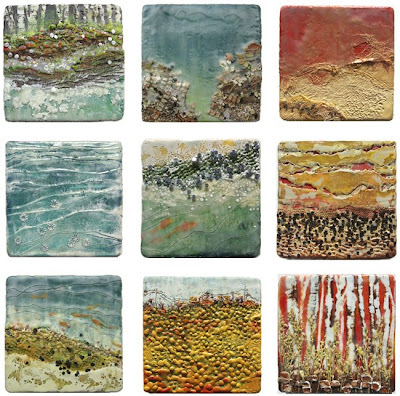 The medium of encaustic provides me with that exploratory means of expression in a way everyday artists techniques can not. Its qualities are sublime and unpredictable, additive and subtractive, translucent and sculptural which strongly influences the direction of the painting. The act of scraping, tearing, building up and burning down the layers of wax from the surface is metaphor for digging into memory and allows me to navigate that internal journey." "I'd like the viewer to discover a new perception of space while possibly revisiting images from their own recollections, sparked by the sensory experience of texture and touch. I choose to render this experience in a way that can be both understood and confusing. Just as one would feel walking down the corridors of a foreign market in a far away culture, making discoveries and unlearning misconceptions. Allen Ginsberg said "Others can measure their vision by what we see". It is the intention of my work that the viewer see the personally familiar in the most foreign, exploring the deeper roots of beauty with a new set of eyes; those beyond the surface or that which goes unnoticed." 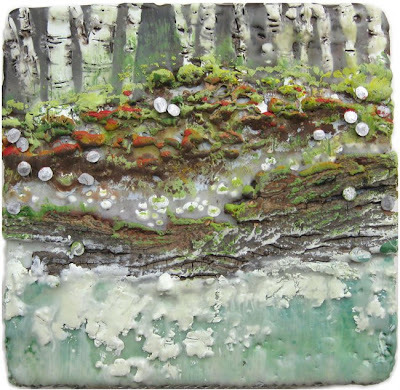 Here's a bit from her artist statement: "I am very drawn to wax and its tactile qualities, the smell and viscosity of the medium are very different from other painting techniques. Creating organic forms is a natural extension of wax’s origin. Coming from a background in graphic design, I am drawn to certain color schemes and shapes, the repetition and placement being important to the composition. My paintings are made by layering multiple coats of wax which can completely obscure the under layers at times. 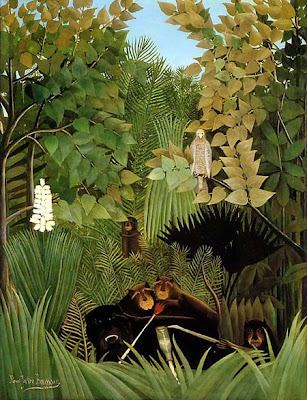 I then scrape away areas of the wax to expose the compositions below." 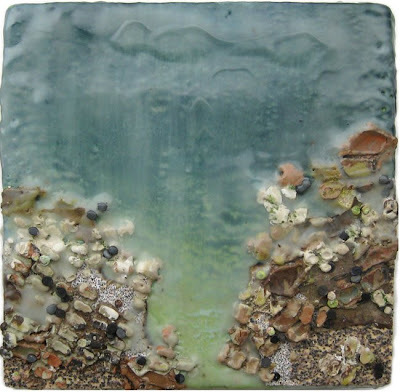 Linda was recently featured in the new book Embracing Encaustic by Linda Womack, check it out here...and be sure to check out her new work in our show, opening this coming Friday, May 1st. The opening reception is from 5-8pm, refreshments will be served and stimulating conversation will be had. 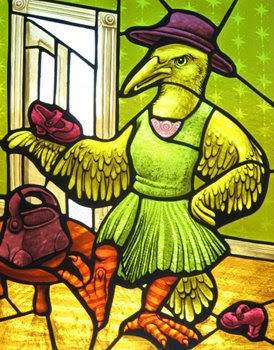 Tim thinks of his own paintings as a highly personal narrative - often employing birds and fish as his central characters and symbolic self-portrait. The constant play between text, texture, and the character are central to his work. Tim paints with acrylics and oils, frequently applied over a background of collage. 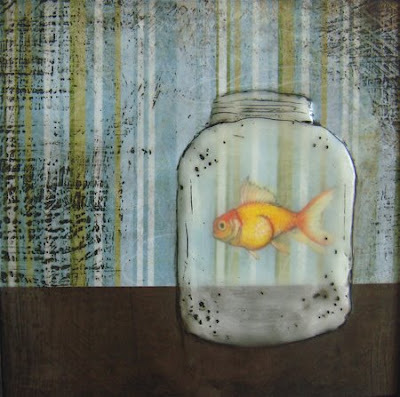 Natural beeswax and resin are then painted or thickly poured over the surface of the paintings before he skillfully etches into the wax and colors the etchings with more paint. 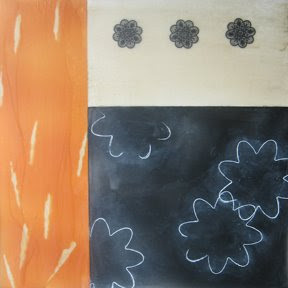 The multiple layers veiled and obscured by encaustic simultaneously distance the viewer and incite curiosity. Originally from New Jersey, Tim currently lives and works in San Francisco. He has exhibited around the Bay Area, with shows at Soul Arch, SF State Gallery, and Space 743 Gallery. In 2004 he was included in the Heart and Soul citywide installation with his piece now displayed at Mo Mo’s restuarant. I am excited to work with Gina Adams for the first time. 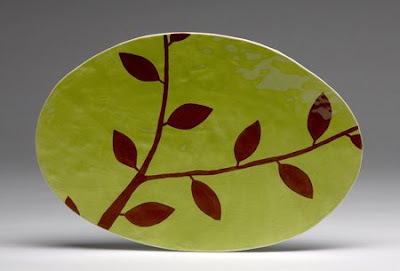 She is one of four artists in our upcoming show, "Making their Mark in Molten Wax". 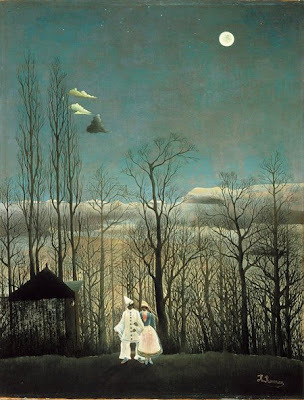 Her work is beautiful, highly sophisticated in form and content. I would like to share with you snipits from her artist statement as it is heart-felt and informative. "I am the grand daughter of an Ojibwa Native American and a Lithuanian woman. My grandfather was removed from his White Earth Reservation at age eight and taken to the Carlisle School in Pennsylvania, or, what he referred to as "white man’s training school". He never returned to his reservation, nor saw any of his native family again. As a child, I spent many hours with my grandfather as he recanted to me the "old ways". He had lived a hard, honest life that he was grateful for and it was extremely important to him that I would know who I was and where I came from. When I was seven, my grandfather took me to a stream, tossed in a pebble, and as we watched ripples spread across the water, he told me that the choices I would make would create ripples throughout my life. He taught me that I could embrace my Ojibwe heritage. He taught me that life was best lived by the seven Ojibwe teachings of truth, wisdom, peace, respect, bravery, honesty, and humility. I have always held this knowledge deep within my heart, and because of that deep connection, I’ve worked toward reaching my heritage on a spiritual level through my studio practice." "My Lace Bead Heritage body of work comes both from the time spent in the studio and from the research and extensive traveling I’ve done for both my Native American Ojibwa and Lithuanian cultures. I have been learning my Ojibwe language for seven years now and was very fortunate to be invited to participate in Language Immersion at Turtle Mountain Reservation in North Dakota, which is a sister reservation to my grandfather’s homeland. To my physical experiences, I add the rich, detailed memories of my youth. My lace beadwork weaves together my grandfather’s oral traditions with the craft that was so lovingly made by hand. 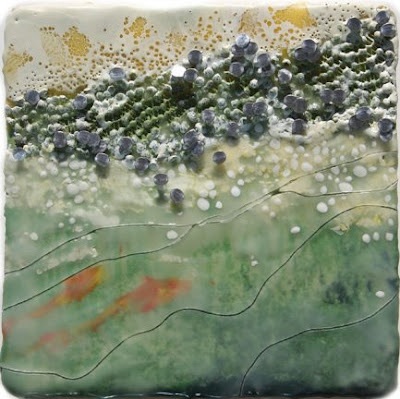 My work is process oriented; the intention being to create work that evokes layered possibilities. The beauty that my ancestors made was not about perfection; instead it was meant as a way to honor both what has come before and what may lie ahead. By creating little bits of beauty in my lace beading, I’ve discovered how very similar I am to them." "Megwitch sa migiwewin nind ki jawendagogiwin tchiwi apagijiwe bekanisid assin pindig nibikang. " With the relatively recent resurgence of artists working with encaustic, I was inspired to put together a group show of four artists working exclusively in the medium of molten wax. 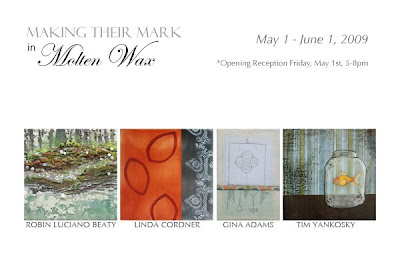 I have admired the work of each of these artists for awhile, and I am quite pleased to announce this upcoming show: "Making their Mark in Molten Wax", featuring works by Gina Adams, Robin Luciano Beaty, Linda Cordner and Tim Yankosky. Join us at the opening reception this Friday, May 1st, from 5-8pm...and stay tuned for posts about each of the participating artists! 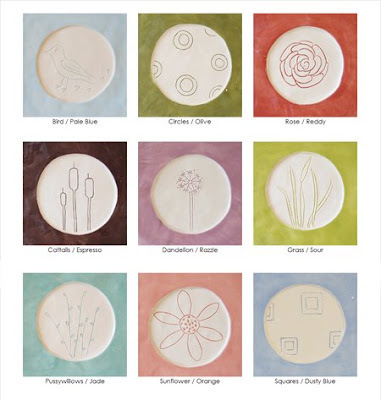 Spring has sprung, and with it comes New Designs from Erin Moran! 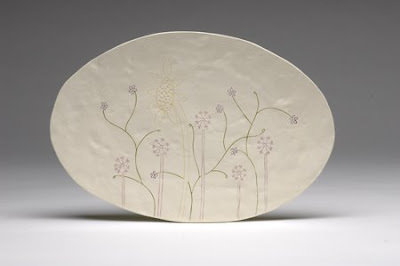 ...and also with scribed designs ("Marsh Plants" is shown in group shot, "Weeds" is shown directly above; Scribed platters $110). 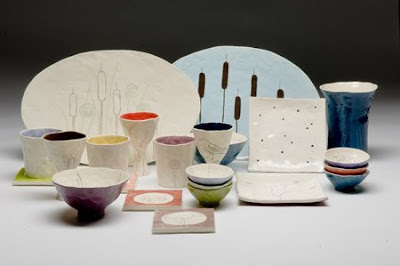 All of Erin's new designs are currently available in the gallery along with the tiny bowls, cereal bowls, dessert plates and vases we have been enjoying already. They will also be available in our online shop sooner than later! Though rain clouds persisted, we made the best of our time in the city. We toured Independence Hall and the Liberty Bell, enjoyed lunch at the Reading Terminal Market, strolled the the Historic Antique Row, and finally explored the Philadelphia Museum Art, followed up by cocktails at the lovely Water Works. This was my first time in Philadelphia, so I had to make time for the typical tourist to-dos...first stop Independence Hall! I was particularly interested in seeing this because Bob and I recently watched "John Adams" the HBO mini-series. I learned that what I always thought was the crack in the Liberty Bell, was indeed the repair. The Philadelphia Museum of Art was wonderful - it was much larger than I expected, and I later realized I missed entire sections - sadly much of the European Art (1500-1850). We entered the museum from the back entrance, and so we walked down the famous stairs that Rocky ran up. I did step inside of his shoes for a moment. On the way to the airport, Bob's brother took us to Fort Mifflin. The fort represents the only pre-Revolutionary fortification. While I found the Fort fascinating, I couldn't help but feel sad and disturbed - knowing that so many people had suffered and died within the walls. I asked a woman working in the gift house about spiritual entities - she went on in detail about experiences she and others had. She also told us that the folks from the show "Ghost Hunter" had been there and reported significant findings. Read more here. *Star Island off the coast of Portsmouth was also investigated by the "Ghost Hunter" crew. Read their findings here. The 15th Annual Spotlight on the Arts Awards was held last night at the Music Hall! 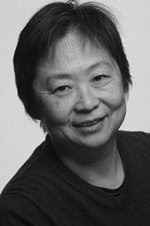 I would like to congratulate my friend and artist Shiao-Ping Wang for winning the award for Best Painter! Congratulations also to my friend Michael Winters (Best Photographer) and all of the other winners and nominees. We are so lucky to live in a place where the arts truly thrive, and it is so nice for the community to take the opportunity to acknowledge this creative spirit each and every year! 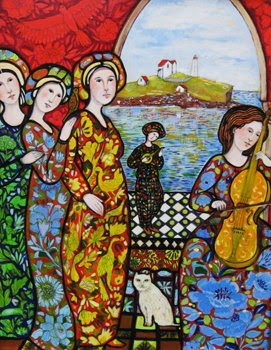 Three Graces is currently featuring "Between the Lines", an exhibition of recent paintings by Marilene Sawaf and stained-glass panels by Monica Wing! Lines of Paint ... Marilene Sawaf was born in Egypt. She studied fine arts at the ABC School of Fine Arts in Paris and is a graduate of Interior Design & Architecture at the University of Saint Esprit in Lebanon. 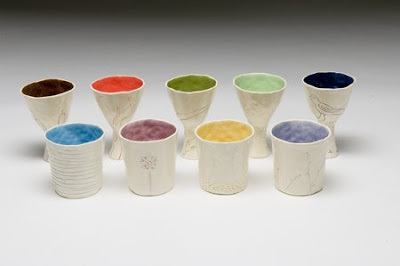 She has exhibited her work extensively throughout New England and abroad. "My first series of women goes back to 1981, after my recent move to New England. My inspiration was a luminous stained glass window that used to cover an entire wall of my grandmother's home in Egypt. I try to create an illusion and mystery that makes you wonder - who are these women and what are they doing? 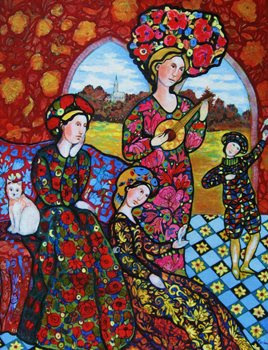 Products of my past culture, of my present taste for rich colors and enigmatic effects, my paintings of women are a mysterious reflection of my most subconscious dreams." 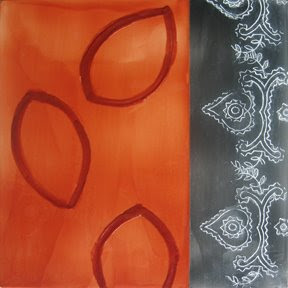 Lines of Lead (and Copper Foil) ... Monica Wing is exhibiting four stained glass panels. Each panel features sections of highly detailed paintings (church-window technique) alongside brilliant patterns and bold textures. 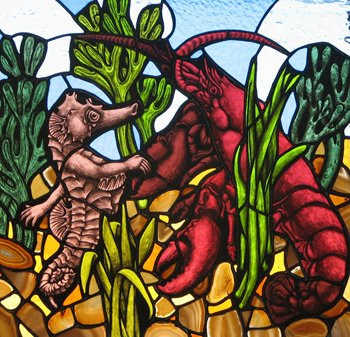 Humor + Whimsy - Shown above is "Her Feet Are Too Big" and below - "Losbster Dance" featuring the said red crustacean taking a pink seahorse by its "human" hand. Please stop in if you are in our lovely Seacoast, and for those of you who are not - all of the works from this show are available to view + purchase in our online shop...here...and here.